The 10 Best Sports Bars in Wisconsin! With Wisconsin being home to the likes of the Green Bay Packers, Milwaukee Brewers, Milwaukee Bucks, and excellent college sports, the Badger State sure does take their sports seriously. So when you can’t get tickets to the game, what’s the next best seat in the house? A sports bar, of course! 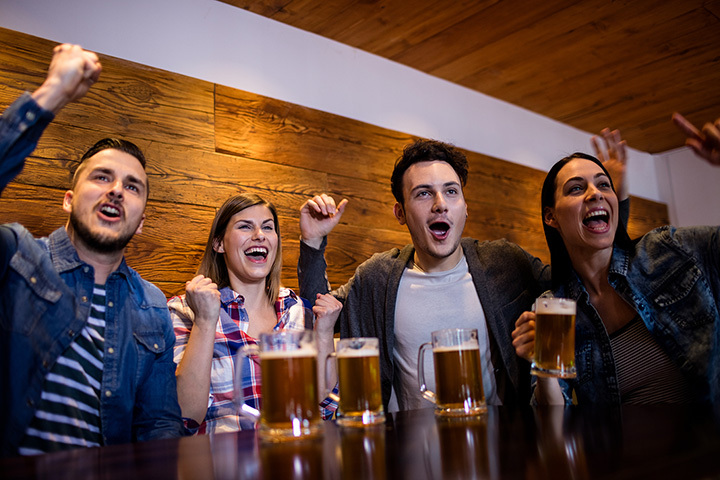 Gather with friends, throw back a few cold ones and enjoy the game at these 10 great sports bars in Wisconsin. If you can’t watch the Green Bay Packer game from within Lambeau Field, head to the next best spot. More specifically the Stadium View Bar and Grill. This is the perfect place to cheer on our beloved green and gold. Their full bar and great food keep the locals and visitors coming back for more. Madison is home to none other than the Big Ten, Wisconsin Badgers. Whether it’s rooting for Badger basketball or jumping up and down with Bucky scores a touch down—Jordan’s Big Ten Pub is where you need to be. Stop in and check out both their game day drink and grub specials. If you’re looking for a comfy and cool sports bar setting to watch the big game in the Milwaukee area, Who’s on Third has got you covered. Grab a beer and order up a basket of their notoriously delicious wings. Sit back and relax, fist pumps are encouraged! Anduzzi’s is another popular spot come game day in Green Bay. This bar is always packed! They host game day events, concerts, and the rooftop bar is where it’s at. With tons of big screen TV’s and endless bar space, it’s no wonder Packer fans set up shop at Anduzzi’s. The Red Zone is your sports bar destination in Madison. Whether you’re rooting on the Badger, Packers, Brewers, Bucks, or Admirals, Red Zone’s got you covered. With great pub grub and an awesome assortment of drinks, The Red Zone will be sure to satisfy on game day. Have fun and tailgate with D2 Sports Pub in Green Bay. Steer clear of pricy tickets and cold December football games by warming up at D2 Sports Pub. Their fantastic prices and tastefully put together pub food will be sure to make it a win in your book, no matter the outcome of the big game. Newly opened LJ’s Sports Tavern and Grill has been a hit in the Madison area. LJ’s fills up fast come game time so make sure to get there early and claim a table or bar spot. Stop in for their weekly drink and food specials and hunker down come game time with a cold beer! The name speaks for itself! Game Time Sports Bar and Grill in Middleton is the perfect place to watch any game. You don’t have to be in town to enjoy the Badger game. Enjoy their food and drink specials while rooting for your favorite team! Before the Brewers hit their home runs, sit down and take a load off at 4th Base Restaurant near Miller Park. After recently celebrating their 40th anniversary it’s no wonder why 4th base is such a hit. Take a gander at their cool memorabilia and sports themed bar area, any sports fan will love the atmosphere. If you can’t make it to the big city for game day—look a little closer to home at Tailgate Sports Bar and Grill. They are always screening sports games and cheering on our favorite in state teams. Sit down and stay at while at Tailgate Sports Bar and Grill in Eau Claire, Wisconsin.